If you don’t see your question answered below, please contact us directly, and we’ll answer your specific question. Q: My garage door will not go down. Q: The lights keep blinking on my garage door opener and the door will not go down? Q: My garage door remotes will not work? Q: How do you change the batteries in a garage door remote? Q: How do you reprogram a garage door keypad? Q: Do I have to replace my garage door if one section is damaged? Q: How much is a new garage door opener? Q: How much is a new garage door? Q: How do I change the seal on the bottom of the garage door? Q: How often should I have my garage door serviced? Q: Where can I purchase Lift Master remotes? Q: Where can I purchase Genie remote? Q: How do you open the garage door during a power outage? Q: How do you manually open the garage door? Q: How do you program the garage door HomeLink for my car? Q: How much does it cost to replace garage door springs? Q: How much does it cost to replace garage door cables? Q: How do I get my garage door open when my car is stuck? Q: Why is my garage door so loud? Q: How do you quiet down the garage door? A: In instances where your garage door will not go down, the most common problem that in our experience with garage doors not going down is that the photoelectric safety sensors, also called safety reversing sensors or photo eyes, are out of alignment. The best course of action is to make sure that the photo eyes that are typically located at the front of the garage door, and are attached to the garage door rails, are pointing directly at each other. Each of the photo eyes should have a solid light that shows that the eyes have power to them. If the safety eyes are out of alignment for any reason, then your door will only go down part of the way, and then automatically open back up. If there is no obstruction, and it is safe to lower your door, one way to get your garage door to close is to hold your garage door wall button down until the garage door fully lowers to the garage floor. Q: The lights keep blinking on my garage door opener and the door will not go down. A: When you press the button on your garage door to get the door to go down, and the door only goes down part way and you see that the lights on the garage door opener starts to blink, then that typically means that’s the photo safety eyes are out of alignment. The best solution is to make sure that each of the safety eyes are powered on and are pointing directly at each other. If you’ve made those two checks, then you should contact us to come out for a service call. Q: My garage door remotes do not work. A: When your garage door remotes are not working, then that could be a sign that either the battery on your garage door opener remote needs to be changed, or that the transmitter on the garage door opener is malfunctioning. A: Most garage door remotes take a small circular battery like the CR-2032. The exact type of battery you need can be determined by examining the battery currently in your garage door remote. Usually, it is a simple matter to open the back case of the garage door remote to remove and replace the battery. If for some reason that does not work, then you may need to replace the garage door remote with a new remote. A: Depending on your garage door opener, start by finding the make and model of your garage door opener. Next, visit the website for your specific garage door opener manufacturer to search for garage door manufacturer’s manual and down load a copy to print and use to guide you through the keypad programming steps. A: In most cases, as long as the garage door was installed after 2006, then sections can be replaced on the garage door. It is best to contact us to make sure on site that the make and model of the garage door is still available. Q: My garage door hits the floor and goes back up, and I’ve verified that the photoelectric safety sensors are powered on and aligned properly. A: When the garage door opener hits the floor and goes back up, it is typically a sign that the down travel limit is not functioning properly. You can usually adjust the garage door down travel limits on the garage door opener. You can find out how to adjust the limits either by downloading the garage door opener manual from the manufacturer’s website, or by contacting us to make a service call. The cost of a garage door opener varies on a number of factors, including the area of the country that you live in. Prices vary depending on your choice of either a chain drive or screw drive garage door opener, for example. 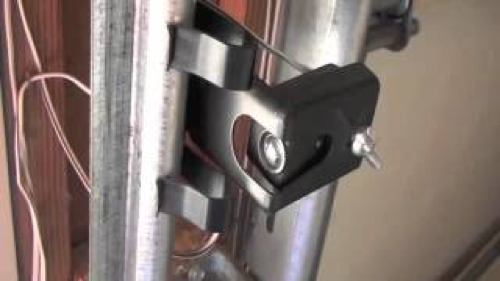 If you are installing an opener for a previously manual garage door, then you’ll need a pair of photoelectric safety sensors. Options include a remote keypad and garage door openers that have emergency battery backup power in case of an electrical power outage. As a baseline, standard garage door openers installations range from $300 to as high as $800 installed for residential garage door openers. m/door-designer/ that you can use to configure a door that fits your needs. A: Every door manufacturer has a different type of seal for the bottom of their garage doors. For best results, please contact us to assess the type of garage door seal that you need, and to install it for you. A: If you have a wooden garage door, then we suggest servicing the door every six months. The reason that wooden garage doors need more maintenance than steel garage doors is that the nuts and bolts that hold your garage door together can easily become loose through normal operation, and should be checked and tightened on a regular basis. If you have a steel garage door, then we recommend having your door serviced once a year. Q: Where can I purchase garage door springs? A: We do not recommend that customers change any type of garage door springs themselves! If you do not have the right tools or experience, you can be seriously injured. Some home improvement companies sell extension springs for customers who want to change garage door springs themselves. The torsion springs—the springs that go above the header on the door—should only be changed by a professional garage door company. Q: Where can I purchase Lift Master remote controllers? A: Lift Master garage door remotes can be purchased from Sound Door Services, or through big box retailers. Q: Where can I purchase Genie remote controllers? A: Genie garage door remotes can be purchased from Sound Door Services, or through big box retailers. A: If you lose power and you cannot open your garage door using the garage door opener, then in most cases garage door installations have an emergency cord that disengages the garage door opener, enabling you to open or close your garage door manually. Once power has been restored, you can reconnect the garage door opener by pulling the emergency cord straight down. Next, press the garage door open/close button on your garage wall, and the garage door opener should reengage itself. A: Follow the steps above to manually open, close, and reconnect your garage door manually. If you do not have a garage door opener, of course you will raise or lower your garage door as you normally do. A: If you live in the area where Sound Door Services garage door openers here in the Puget Sound region, then the average price to replace a torsion garage door spring is about $179. A: If you live in the area where Sound Door Services garage door openers here in the Puget Sound region, then the average price to replace garage door cables is about $49 plus labor. A: If your car is stuck in the garage, you first want to ensure that you can do so safely. First, ensure that the spring on your garage door is not broken. If the garage door spring is broken, then you should contact Sound Door Services to repair your garage door spring and to help get your car out of the garage. Q: Why is my garage door so loud when I open or close the door? A: In most cases, noisy, loud garage doors are caused by lack of lubrication and service for the garage door. Contact Sound Door Services to service your garage door and garage door opener to help quiet down your garage door. A: If you to try to quiet your garage door yourself, then you can try to lubricate and service all of your garage door’s moving parts as well as your garage door opener. Copyright © 2019 Sound Door Service. All Rights Reserved.